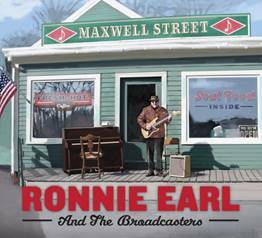 Maxwell Street, the new CD from three-time Blues Music Award winner as “Guitarist of the Year,” Ronnie Earl and his band, the Broadcasters, is a must-have addition to your music collection. Ronnie Earl and the Broadcasters are also represented with a track on the new Stony Plain special 3-CD set, 40 Years of Stony Plain, which salutes the label’s four decades of the best in roots, rock, folk, country and blues music. To commemorate Stony Plain’s anniversary, Ronnie Earl recorded this short video about their relationship and is viewable on this page. “Ronnie Earl is one of the most sensitive, refined and exquisite guitarists on the international blues scene.” - Living Blues.